Below the first table you will find 6x6 Sudoku puzzles for children. These were created with symbols instead of numbers. The 4x4 page contains additional Sudokus with symbols that are even more suited for beginners. Solution 60 easy Sudoku puzzles with 6x6 cells and brickwall pattern areas (13 KB). 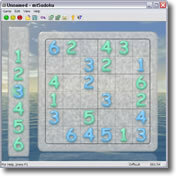 Solution 60 easy Sudoku puzzles with 6x6 cells and ladder pattern areas (19 KB). Solution 60 medium Sudoku puzzles with 6x6 cells and brickwall pattern areas (13 KB). Solution 60 medium Sudoku puzzles with 6x6 cells and ladder pattern areas (19 KB). Solution 60 difficult Sudoku puzzles with 6x6 cells and brickwall pattern areas (13 KB). Solution 60 difficult Sudoku puzzles with 6x6 cells and ladder pattern areas (18 KB). Solution 60 easy Sudoku puzzles with brickwall pattern areas and symbols instead of numbers (13 KB). Solution 60 easy Sudoku puzzles with ladder pattern areas and symbols instead of numbers (19 KB).